Announced today, Microsoft will be investing $300 million into a new partnership with Barnes and Noble. The two will form a new subsidiary of Barnes and Noble, that will include all of the Nook business along with the educational college business. The current Nook runs Android and has in itself become a bit of an underground fan favorite among hackers who have found it relatively easy to root enable for a low-cost Android tablet. Microsoft’s stake in the new venture is 17.6 percent, so B&N will still own the bulk of the partnership. 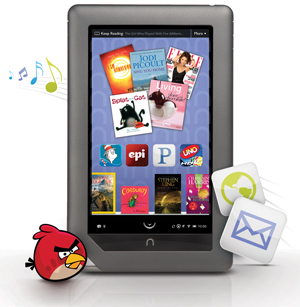 With Windows 8 almost upon us, the two will work on bringing a Nook application to the new platform. Amazon’s Kindle Fire is the leading Android tablet in the market and Apple’s iOS has iBooks. Microsoft will now have their own eBook platform to integrate with their assorted mobile and desktop platforms.